It’s been that way since I was 9 years old. That was the Summer of 1981, when the Internet was barely a blip in Al Gore’s neural processors and my next door neighbor – an older kid named Jay – wandered over and asked my Mom if I could go to the movies with him. There was this awesome new adventure flick that he was dying to see and he had sweet-talked his Mom into dropping him off at the theater. She agreed as long as he brought a friend. While she shopped at the neighboring Sears, he could take in the movie. So – my Mom asked me if I wanted to go – and although I had no idea what this film was about, I signed on. Talk about a different time. A 12-year-old and a 9-year-old were parked at the movie theater for 2 hours with no parental guidance and nobody blinked an eye. My kingdom for Department of Social Services. Fortunately for me, the Feds never swooped in and I walked into Raiders of the Lost Ark stone cold on the cold, hard facts. I knew nothing. Hadn’t seen a trailer. Never read a description. Knew Harrison as Han Solo. That’s it!!! In this day and age where you can practically stream the reboot of a new movie before the original is even released, it seems unheard of to walk into a major summer blockbuster with not one single story thread to hang onto. But that’s how I saw Raiders of the Lost Ark. I walked in a total virgin and walked out feeling very promiscuous for whatever else Hollywood wanted to send my way – although definitely not Harvey Weinstein!!! So, no matter how busy my life gets, I’m always making a mental checklist of all the movies I have to see – whether it is up there on the big screen or while cozy at home – and while the list of movies I see at home versus the theater has swung firmly in favor of the pajamas & slippers domain – I still make it out for spectacle. I’m a sucker for it. I’ll let you decide which one made it to a legitimate Date Night. All of this rambling preamble has a point. Every year I like to pick my Top 5 Favorite Movies of the Past Year and write a little something about it. I’m not handicapping the Oscars here. I have no intention of telling you what was the Best Movie of the Year because I’m not looking at these things through a critic’s eye. There was a time – a long time ago – when I used to review movies for a college paper. While I loved writing about movies, I found that the more I dissected them, the less enamored I felt – and that was no way to treat something I felt genuine affection for over such a long period of time. So, I took a long hiatus from writing about movies before finally working my way back to it out here on this site where I have only one rule – write off the cuff. Say what I mean to say. For this year’s list, I decided to do things a little differently. I’m going to list out every movie I saw that was released in 2017 (in no particular order) and write one or two quick sentences about that movie and what I thought. I’m not putting a lot of thought into those sentences either. I’m not looking to boil a master’s thesis down into a blurb. This will be done completely off-the-cuff. At the end of the post, I’ll select my Top 5 Favorites. And then – presuming you make it to the end – your job is to chat away in my handy-dandy Comments section and let me know what you loved or didn’t last year. I’m a sucker for a good movie suggestion so show me the way. Hidden Figures – This was a compelling true-story about the African-American women who made a massive contribution to the moon landing; and while it is well-cast in the lead roles, the film comes across as made a little on the cheap, like a Made-for-TV movie blown up for the big screen. Worth the watch but it could have used a little more nuance and polish. Split – M. Night Shyamalan was once the biggest thing going in suspense before he started believing his own hype; putting too much stock into his Twilight Zone-esque twist endings. Here he works lean and mean; crafting a truly satisfying thriller with some surprising ties to his earlier work. It’s encouraging that I can’t wait to see what he does next. A Dog’s Purpose – A movie featuring a cute pup dying every 10 minutes should have wrung every last ounce of liquid from my tear ducts but this one was too cheaply cloying and never earned the sentiment. Josh Gad’s voiceover was the wrong fit for various reincarnations of the dog, too. Who wants a furry Olaf? If this comes on again, I think I’ll just roll over and play dead. John Wick: Chapter 2 – Keanu Reeves, like Arnold Schwarzenegger before him, is always best when a film leans into his wooden strengths; which is why the John Wick series has proven to be so much fun. Dialogue is kept to a minimum as the mysterious Wick makes his way through a secret society of international assassins – never shooting the breeze, just lots of heads. The Lego Batman Movie – All you need to know is that I now rank Lego Batman as the best incarnation of Batman; slightly above Christian Bale and Michael Keaton and leagues better than Ben Affleck, Val Kilmer, George Clooney and yes, even Adam West. I mean c’mon – he ends his days by rematching Jerry McGuire and laughing his cowl off. A Cure for Wellness – Director Gore Verbinski may have hit the mainstream with his Pirates of the Caribbean trilogy but this creepy flick feels more in tune with an earlier hit, The Ring. While I didn’t love where this film ended up (and I am decidedly against Dane De Haan as a lead actor who has all the charisma of an auto-tuned Leonardo DiCaprio) – I was completely sucked into the air of menace that Verbinski lends to this tale of a mysterious spa catering to the whims of the super rich. It’s just too bad it goes so far off the road in the end. 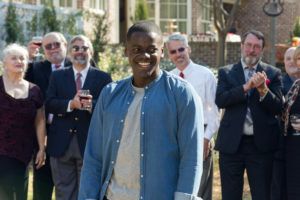 Get Out – I saw this movie right after A Cure for Wellness and similarities in plotting aside, Get Out gets so much right that A Cure for Wellness botches by the time it reaches its overheated finale. Nice to see director Jordan Peele’s smart, funny, scary and very timely thriller get some Oscar love when nominations were announced last week. Logan – This film showed there is rich material left to mine in the superhero genre. These films don’t always have to be about chasing the glowing doodad in order to stave off the apocalypse. Sometimes it’s OK if the stakes are simply finding one’s way in a changing world. Logan was bruising at times and hit harder than I expected. Guardians of the Galaxy vol. II – A shaggy sequel that loses some of the pleasant surprise of the original but was still very weird and enjoyable. I love that the first film kicked open the door to the crazier corners in the Marvel universe – allowing the company, and films like this, to let their Freak Flag Fly!!! Alien Covenant – I want to love these movies because I am an unabashed fan of Ridley Scott’s original and James Cameron’s action bent in the sequel – but Covenant and Prometheus before it, are too enamored in retelling the Frankenstein myth; leaving the aliens as scuttling busywork lurking around the edges. Covenant looked beautiful though as Ridley Scott shoots the hell out of every picture he ever makes but pretty will only get you so far in life. Wonder Woman – I saw this on my birthday and absolutely loved it. Once would have been enough though because on repeat viewings I feel there is some drag and bloat in this that weighs the story down. That said – it’s a gorgeous film with real chemistry between Gal Gadot (who owns this part) and Chris Pine. Based on where this ends up; that chemistry will be sadly missed in the sequel. Baby Driver – I’ve been a fan of director Edgar Wright ever since I saw Shaun of the Dead, his debut film. He followed that with Hot Fuzz, Scott Pilgrim, The World’s End and finally Baby Driver. He’s always been so inventive with his filmmaking and the way he sets his action beats and car chases to an infectious soundtrack makes every Fast & the Furious movie look like old school Mario Kart from here on out. Spider-Man: Homecoming – If we’re to believe that “with great power comes great responsibility“, then I say Spider-Man lives and dies by its Peter Parker. In Tom Holland, they have found the definitive Parker – infusing the newly Spidey with a great wiseass teenage wit. This is pure fun though-and-through; a John Hughes flick through the Marvel prism that absolutely gets the appeal of putting a kid in the suit. 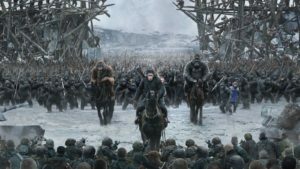 War for the Planet of the Apes – There would be no ‘War for the Planet of the Apes‘ without bleeding edge special effects but what makes this film so special is that unlike most blockbuster tentpole flicks – the effects are not there in place of the story; they are absolutely essential to painting the fractured world upon which director Matt Reeves brings this trilogy to a bruising and soulful ending. We live in an age of casual magic where computer graphic designers can wish almost anything into reality – so it takes a lot to wow me these days. Over three movies – Andy Serkis as Caesar has done just that and then some. Valerian and the City of a Thousand Planets – Watch this for the bravura 10-minute opening sequence – where we see the city grow from its humble beginning as the International Space Station to this mammoth world of a thousand diverse alien cultures (all set to David Bowie’s ‘Space Oddity’) and then shut it off when Dane De Haan appears. Seriously; I’ve met more interesting manilla folders. 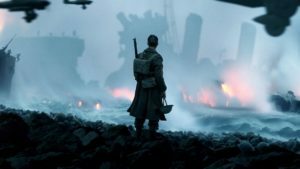 Dunkirk – I have seen countless action and war movies in a theater and heard the barrage of a billion bullets in senses-shattering Dolby Digital Surround Sound. None of them have carried the weight of that the first bullet you hear in this harrowing survival tale; as it rings out early on while soldiers slowly walk down a deserted city street. From that moment – every sense is attuned to Christopher Nolan’s clockwork thriller. This film is less about telling you the same old war stories – tossing us right there in the midst of these boys just trying to get home and live another day. This was the one movie I saw this year that ABSOLUTELY has to be seen on the big screen. The Shape of Water – Guillermo del Toro is passionate about cinema, monster movies and old-fashioned romance; so this one could only be called his passion project. That type of direction can sometimes lead a director down the rabbit’s hole – just because he loves something doesn’t mean it will connect with an audience – but in this film, easily his most personal and heartfelt – del Toro delivers a fable that feels timeless and unique. 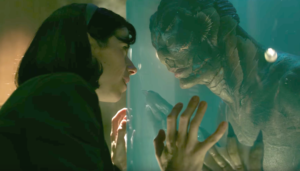 This is a truly lovely film and now that it is leading the pack in the Oscar race, del Toro should get the capital he needs to make more of what he loves – and that’s good news for film fans like me. It – I am a huge unabashed Stephen King fan so when I saw that both The Dark Tower and It were getting big Hollywood productions – and being released mere weeks apart – I was thrilled. The word on Dark Tower was bad so I have yet to see it but It proved that audiences will follow a story into some pretty dark corners so long as they have characters to care about. This film absolutely nailed the casting of The Losers Club which was critical to getting us in their corner. Bring on Chapter II. Kingsman: The Golden Circle – This one shares a common thread with Guardians of the Galaxy vol. II. I was head over-heels-in-love with the first film but the follow-up loses some of the magic. I love the world they’ve built here BUT they lost some of the well-earned gravitas by bringing Colin Firth back. He was amazing in the first film and they wrote themselves into a corner by killing him – losing their secret weapon in the process. That death was important because it showed this was not going to be your ordinary James Bond-style spy caper. By bringing him back and then going the Moonraker route of getting too crazy with the sci-fi shenanigans, Kingsman loses that which made it stand out from the crowd. Blade Runner: 2049 – Here’s a sequel some would say 30 years too late that actually plays like a day hasn’t passed. The world is as broken and decayed as we remember – and I found myself completely absorbed by the central mystery Ryan Gosling is chasing down, so much so that I completely forgot Harrison Ford would eventually show up. Unlike his recent return to Indy and Solo, Ford feels genuinely engaged in this film. His appearance is no stunt casting, either – with Deckard deftly woven into the very human plot twist that pushes this to an emotional conclusion. Thor: Ragnarok – This was my favorite comic book flick of the year; which is a surprise because as much as I really dig Chris Hemsworth’s turn as the God of Thunder, his first two movies have been slightly creaky affairs. Here, director Taika Waititi goes all in – given us a sly Big Trouble in Little China homage. 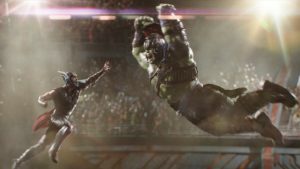 Thor: Ragnarok is a crazy, go-for-broke action movie with ingenuity and invention to spare. Three Billboards Outside Ebbing, Missouri – This popped on my radar early in the Fall when I read it was written and directed by Martin McDonagh, a playwright who in recent years turned his attention to the big screen; notably with his poignant yet pitch-black comedy, In Bruges. Billboards improves on Bruges sly plotting and deft wordplay – equally fierce in its dark comedy and throbbing-emotional heart – as it pits Frances McDormand’s “mad as hell” mother against the genial small-town police chief (Woody Harrelson) who she blames for not doing enough to solve her daughter’s murder. Less of a whodunnit – McDonagh’s flick is more concerned with asking “how do we move forward” when leveled by tragedy. This one leaves a mark. The Disaster Artist – I wrote about this here BUT this one felt real close to home. I was The Original Disaster Artist. Don’t believe me – just ask my friends who are still waiting for that film to finally be finished. I, Tonya – I first noticed Margot Robbie in a small but luminous role in the equally lovely About Time. She’s continued to impress ever since. In I, Tonya she absolutely owns the ice – which is no easy feat with Allison Janney absolutely torching the place in her role as Tonya Harding’s mommie dearest. Both scored well-deserved Oscar nominations. Star Wars: The Last Jedi – A solid Star Wars flick that goes to some strange places (and the movie is better when it does). This is also the one Star Wars movie where Luke Skywalker finally becomes the badass samurai warrior he was always intended to be (which makes sense when you realize Star Wars: A New Hope is just George Lucas’ sci-fi gloss on Kurosawa’s The Hidden Fortress). 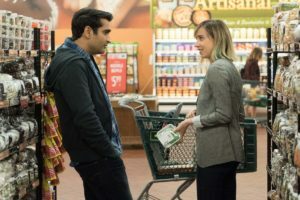 The Big Sick – Midway through Kumail Nanjiani’s autobiographical look at how he and his wife survived culture shocks and even more bracing health scares – I came across this line – “I am overwhelmed by you” – said in the sweetest, most loving manner at a moment when the two leads put it all on the table about how much they mean to each other. May everyone find themselves overwhelmed. That’s a good life, right there. I haven’t seen most of these but 3 out of the last 5 were on my list to see so I will start there before hitting some others on the full list. You’ve highlighted probably another handful I hadn’t considered. That’s a good plan – and with your somewhat frequent air travel, maybe you can bang some of the others out. I never would have seen as many as I did without access to that secret portal. 🙂 Gone are the days when we would see twice as many as this list IN THE THEATER!!! Just don’t see “A Dog’s Purpose”. Stupid movie even botched the idea of a dog dying numerous times. That should be Sudden Onset Eye Allergy gold!! !